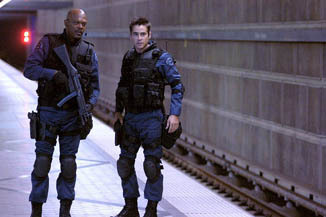 In what is perhaps best described as "The Fast and the Furious meets NYPD Blue," S.W.A.T. is an action flick with a young ensemble cast about an elite team of LAPD cops that must protect an extremely dangerous criminal. Samuel L. Jackson will play the voice of experience amongst the youngsters - yes, I did just say "Samuel L. Jackson will play the voice of experience"- a group that includes Colin Farrell, LL Cool J, Michelle Rodriguez, and Jeremy Renner. Several actors had been slated for Farrell's role previously; in fact, the film was originally supposed to be a less "hip" movie starring Arnold Schwarzenegger (though Paul Walker and Mark Wahlberg were also in talks for the role). S.W.A.T. marks yet another step in Farrell's meteoric rise to stardom. If it seems like you've been seeing a lot of him lately, you're absolutely right - this will already be the fourth film of 2003 for Farrell when it is released in August, with two more scheduled for release in the fall.